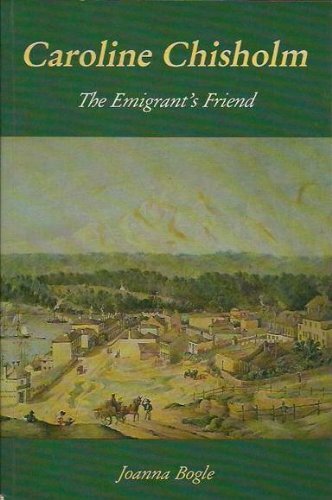 Caroline Chisholm was known as 'the emigrant's friend' and was one of Australia's most outstanding women. In 1994, she was posthumously awarded the Order of Australia and her image was on the five dollar banknote for over twenty years. Caroline Chisholm has also been featured on stamps and there are numerous buildings, organizations and establishments which bear her name. Caroline was born in 1808 near Northampton, England. She was the daughter of William Jones, a successful farmer. From an early age she absorbed the family tradition of evangelical philanthropy and was always interested in helping people. Caroline was tall and well-spoken. When she was 22, she agreed to marry a man thirteen years her senior on condition that she could continue her philanthropic work. Captain Archibald Chisholm was an employee of the East India Company and a Roman Catholic. Caroline converted to Catholicism and in 1832, the couple went to Madras. Here, Caroline founded the Female School of Industry for the Daughters of European Soldiers. In 1838, Archibald took leave and they went to Australia, arriving in Sydney on the Emerald Isle. At this time Sydney was still a convict town. In 1840, Chisholm was recalled to active service. Caroline remained in Australia with her three sons. Caroline liked to explore her new home town but was shocked to find many women living on the streets. Having been forced to emigrate on filthy, overcrowded ships, they were languishing in Sydney without employment despite the desperate shortage of labour in the rural areas. Caroline began meeting ships and became well known on the wharves. She took in many of the immigrant girls and looked after them until she could find employment for them. In 1841, despite battling anti-Catholic sentiment, she was eventually granted part of a building to use as a Female Immigrants' Home. She was able to house up to 96 women in the disused Immigration Barracks. She also ran a free employment registry from the building. Within two years at least 2,000 women had been installed in jobs and homes. Her next problem was to encourage the unemployed to go into the countryside. She accompanied many parties of people into the bush and tried to allay their fears of the wilderness. Resting stages and employment agencies were set up at a dozen rural centres and in 1842 she was able to close the Home as there was no further need of it. Her next project was to put forward a scheme for settling families on the land. This met with opposition from land-owners so she settled 23 families on land at Shellharbour. The land had been given to her by Robert Towns. In 1844 she reported on her endeavours but her plan for a similar scheme to be run by the government was again rejected. In 1845, Chisholm (now Captain Chisholm) returned to Australia. As there was no assistance forthcoming from the government of the day, the Chisholms traveled through New South Wales collecting anecdotal evidence from some 600 immigrants. This 'information' was to be collated as a guide for those wishing to emigrate from England. In 1846, the Chisholms left for England where her passionate arguments won the sympathy of Earl Grey and James Stephen. As a result, she achieved free passage to Australia for emancipists' wives (who sailed on the Asia and Waverley) and for 75 children. A measure of the esteem in which she was held can be gauged by the fact that she was invited to give evidence before two House of Lords committees. The Chisholm's home became an information centre for all things Australian and they regularly dealt with a daily mail of 140 letters. Her pet project at this point was family emigration. After suffering a defeat at the hands of alarmed squatters, she formed a Family Colonisation Loan Society. The society held the savings of intending migrants and lent them what they needed for their passage to Australia. Agents in Adelaide, Melbourne and Sydney found employment for the emigrants and were responsible for collecting the moneys owing. These moneys were repaid in manageable installments. Losses through death or default were borne by a reserve fund. Charles Dickens was also a strong supporter of the Society. The first ship chartered to deliver family groups to Australia was Slains Castle which sailed on 1 October 1850. Caroline was there to oversee the embarkation of passengers. She placed unaccompanied girls with families and the aged with younger people. She appointed a trusted surgeon to accompany the passengers, giving him responsibility for distributing food during the journey. Following the discovery of gold, emigration was stimulated to the effect that six ships were chartered to make the journey. In 1851, Captain Chisholm returned to Australia as colonial agent leaving his wife to manage the Society's affairs in Britain. She toured the British Isles in 1852, then Germany, France and Italy where she visited the Pope. Largely due to her efforts, the Passenger Act of 1852 was passed. W S Lindsay built the Caroline Chisholm for the Society. Mrs Chisholm was now one of England's most famous women. When she returned to Australia on the Ballarat in 1854, there was widespread publicity of the event. Captain Chisholm meanwhile had almost single-handedly ensured the success of his wife's scheme in Australia. However, the family was now in desperate need and they opened a store with money that had been collected for them. She toured the goldfields of Victoria and by the end of 1855 ten shelter sheds were being constructed on the route to the goldfields. In 1857 they moved to Kyneton. Archibald Chisholm had been promoted to Major in his retirement and sat on the magistrate's bench. Their two elder sons ran the store. In 1862, their financial circumstances were such that Caroline opened a girls' school at Newtown. The school later moved to Tempe. Caroline Chisholm's final years in Australia were spent in virtual obscurity. She had accepted no remuneration for any of her work. She had no time for material reward or public position. In 1866, the Chisholms returned to England. They were granted a pension of 100 pounds and lived first in Liverpool then Highgate, London. Caroline was almost penniless and virtually forgotten. On 25 March 1877, Caroline Chisholm died. Her husband passed away in August 1877. The headstone on their grave at Northampton is inscribed 'the emigrant's friend'. Caroline had the unwavering support of her husband. Her idealism and courage, her executive ability and personal charm saw her achieve great benefits for the women of the new colony. She is truly one of Australia's great women.